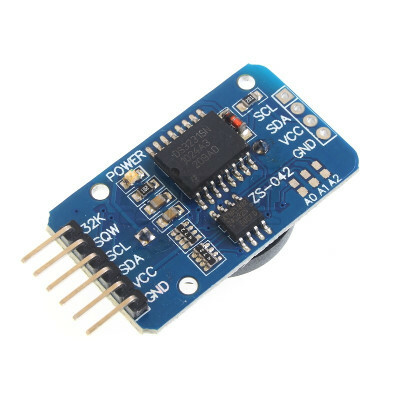 The DS3231 real time clock is a low-cost, extremely accurate I²C real-time clock with an integrated temperature-compensated crystal oscillator and crystal. The DS3231 real time clock is a low-cost, extremely accurate I²C real-time clock with an integrated temperature-compensated crystal oscillator and crystal. Compared to the DS1307, the DS3231 is more accurate, losing or gaining just a few seconds a year. Like the DS1307 it can be used for logging data, building clocks, adding time stamps to your data, for alarms, timers and more. The RTC maintains seconds, minutes, hours, day, date, month, and year information. The date at the end of the month is automatically adjusted for months with fewer than 31 days, including corrections for leap year. The clock operates in either the 24-hour or 12-hour format with an active-low AM/PM indicator. Note: The DS1307 uses a CR2032 coin cell battery which is not included and must be purchased separately.